Thomas Bastian is the lead fund manager. He started managing this moderate allocation fund in April 2003. The fund was first introduced to public in 1960. The total net assets of this Invesco fund are $10.64 billion. 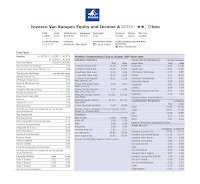 This fund has annual expense ratio of 0.81%. This figure is quite close to the average in the Moderate Allocation category (0.98%). Investor can start investing in this balanced fund with a minimum initial investment of $1,000. This amount applies for either brokerage or IRA account. The minimum subsequent investment needed is $50. This fund has 0.25% of 12b1 fee. The front end sales load fee is 5.50%. This fund is available for purchase from 124 brokerages, such as E Trade Financial, JP Morgan, Merrill Lynch, Scottrade Load, Schwab Institutional, Fidelity Retail Funds Network, Ameriprise Brokerage, etc. 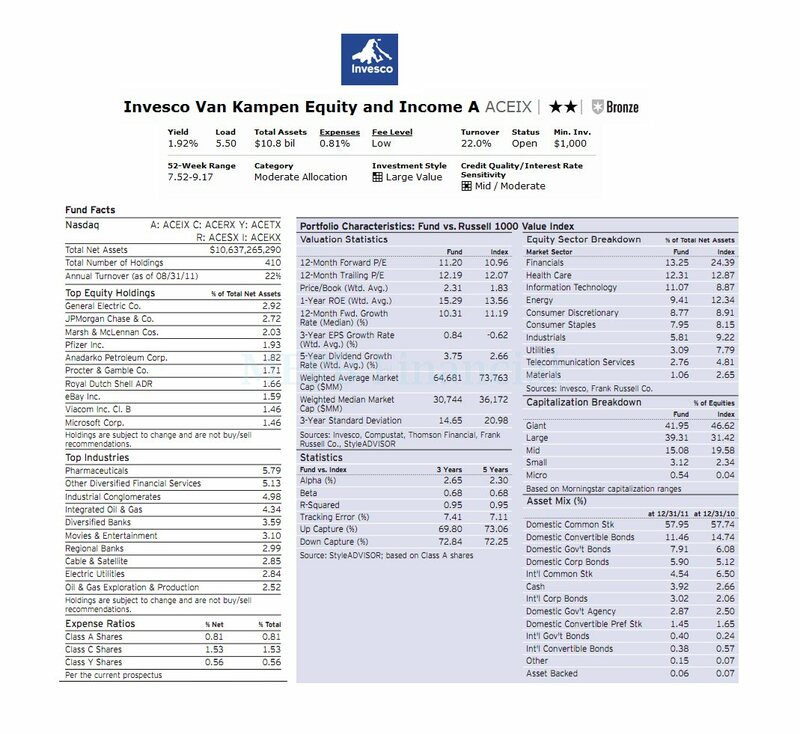 The other classes of this fund are Class C (ACERX), Class Y (ACETX), Class R (ACESX) and Class I (ACEKX). The top 10 holdings of this fund as of December 2011 are General Electrics Co (2.92%), JP Morgan Chase & Co (2.72%), Marsh & McLennan Co (2.03%), Pfizer Inc (1.93%), Anadarko Petroleum Corp (1.82%), Procter & Gamble Co (1.71%), Royal Dutch Shell A ADR (1.66%), Ebay Inc (1.59%), Viacom Inc Class B (1.46%) and Microsoft Corp (1.46%). These are the top ten companies out of 410 total holdings. The top industries as of December 2011 are Pharmaceuticals (5.79%), Other Diversified Financial Services (5.13%), Industrial Conglomerates (4.98%), Integrated Oil & Gas (4.34%) and Diversified Banking (3.59%). The top sector breakdown is Financials (17.60%), Health Care (16.30%), Information Technology (14.70%), Energy (12.50%) and Consumer Discretionary (11.60%). The Principal Investment Risks include Foreign Investment risk, Derivatives Risks, Forward Currency Contracts, Futures Risk, Options Risk, and management risk.